R. And flourish forever before the Lord. Alleluia. St. Vincent, who at the tenderest age didst display a wisdom most mature, Pray for us. 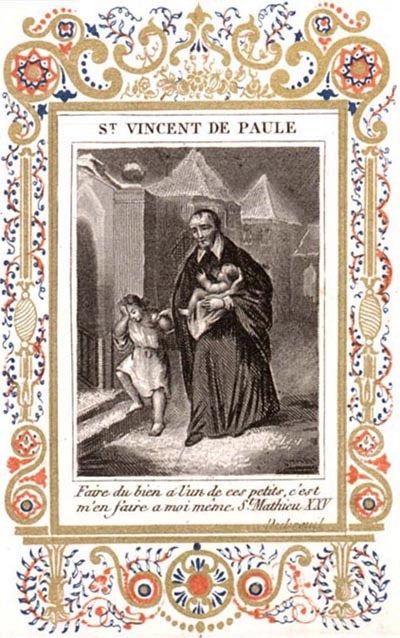 St. Vincent, who from thy childhood wast full of pity and compassion, Pray for us. St. Vincent, who like David, from a simple shepherd becamest a ruler and pastor of the people of God, Pray for us. St. Vincent, who in thy captivity by Turkish pirates didst preserve perfect freedom, Pray for us. St. Vincent the just man, who didst live by faith, Pray for us. St. Vincent, always supported on the firm anchor of a Christian hope, Pray for us. St. Vincent, always inflamed with the fire of perfect charity, Pray for us. St. Vincent, truly simple, upright, and fearing God, Pray for us. St. Vincent, true disciple of Jesus Christ, always meek and humble of heart, Pray for us. St. Vincent, perfectly mortified in heart and mind, Pray for us. St. Vincent, ever animated with the spirit of Our Lord, Pray for us. St. Vincent, generous maintainer of the glory of God, Pray for us. St. Vincent, ever inwardly burning and ever outwardly transported with zeal for souls, Pray for us. St. Vincent, who in Christian poverty didst find the precious pearl and the rich treasure of the Gospel, Pray for us. St. Vincent, like to the Angels in thy purity, Pray for us. St. Vincent, faithful in obedience and victorious in word and deed, Pray for us. St. Vincent, who didst fly the slightest appearance of evil, Pray for us. St. Vincent, who in all thine actions didst aspire to the practice of perfect virtue, Pray for us. St. Vincent, who didst remain like a rock amidst the stormy sea of this world, Pray for us. St. Vincent, invincible amidst the arrows of adversity, Pray for us. St. Vincent, as patient in suffering as thou wast indulgent in forgiving, Pray for us. St. Vincent, ever docile and obedient son of the Holy See, Pray for us. St. Vincent, who hadst exceeding horror of the novel ways and subtle words of heretics, Pray for us. St. Vincent, destined by a special Providence to announce the Gospel to the poor, Pray for us. St. Vincent, father and model of ecclesiastics, Pray for us. St. Vincent, prudent founder of the Congregation of the Mission, Pray for us. St. Vincent, wise institutor of the Congregation of the Sisters of Charity, Pray for us. St. Vincent, tender in compassionating and prompt in relieving the necessities of the poor, Pray for us. St. Vincent, equally fervent in the practice of prayer and in ministry of the word, Pray for us. St. Vincent, admirable in imitation of the life and virtues of Jesus, Pray for us. St. Vincent, who didst persevere to the end in shunning evil and doing good, Pray for us. St. Vincent, who as in life so in death wast most precious in the sight of God, Pray for us. St. Vincent, glory of France and pride of Paris, Pray for us. St. Vincent, patron of all charitable associations, Pray for us. R. And showed unto him the Kingdom of God. Let Us Pray: O God, Who by an effect of Thine infinite goodness, hast renewed in our days, in the apostolic character and humility of Thy blessed servant Vincent, the spirit of Thy well-beloved Son—to preach the Gospel to the poor, relieve the afflicted, console the miserable, and add new luster to the ecclesiastical order—grant, we beseech Thee, through his powerful intercession, that we also, delivered from the great misery of sin, may labor to please Thee by the practice of the same humility, through Jesus Christ Our Lord, Who liveth with Thee and the Holy Ghost, ever one God, world without end. O God, Who for the preaching of the Gospel to the poor, and for promoting the honor of the priesthood, didst endue blessed Vincent with the zeal of an apostle, grant, we humbly pray Thee, that we who venerate his holy life may profit by the examples of virtue he has left us.